Delivering sophisticated, mission specific open source websites and mobile applications. Promet Source revolves around customer satisfaction and providing dynamic solutions returning, real measurable results. We don’t just work for our clients, we work with our clients as a seamless extension of their team. Our core focus is to inspire with our strategy and deliver groundbreaking results with our approach. Promet Source is the champion of complex web development projects that require custom code, custom module development, custom APIs, migrations, sophisticated integrations and much more. Our roster is stacked with professional, Acquia certified Drupal developers that have been on the bleeding edge of open source capabilities for over a decade. Extending and improving the functionality of your website or mobile application is both a core service and one of our core values. Through our Drupal Managed Services support plans we guarantee continuous upgrades, constant security updates, 24x7 monitoring, 24x7 response times, development level support and open communication. Promet Accessibility specializes in ADA, WCAG, and 508 compliance audits, code level remediation, accessibility training and on-going support. 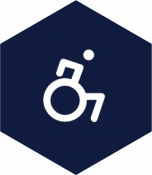 Whether you have an existing website, are in the process of building a new one or need a digital accessibility partner to work with your clients, we will ensure your digital products are accessible to all. We wrote the book on Drupal training – literally. Our training practice team is led by Acquia certified Drupal expert Margaret Plett, author of Acquia's own Drupal 8 training curricula. With public online and in person training options throughout the United States, in addition to private training, Promet has you covered on Drupal best practice training for your entire team.